I give up. My edges weren't as curled as yours, but it was cupping, which is sorta worse. Drat....it looked so good on paper! I'm sorry. The only other thing I can think of is working it with the jogs in there, and filling them in with a border as I described earlier. You'd have to end a row with foundation DCs to make that row longer, and chains (2 more than the number of stitches you need to start the next row with, to allow for turning when you make the first DC into the 4th chain from the hook) to form the foundation of the longer beginning of the next row. I've been following your all's work on this, it's fascinating! at the point you are now with the curving issue, I wonder if the proportion of the stitch comes into play? in the chart , the stitches are quite tall in comparison to their width, it seems to me. so I wonder if a taller stitch would help? like a triple, or an extended dc. All I can say is thank you both for every little bit of help you've given, as I never would have gotten half this far without you. I felt home free last night and then started working it and hitting that issue, but we almost had it. I feel like we're just a few solutions away from getting it right. The only thing I hate about the jog is ( I did get it down to slst 3 or 4 with each decreased pattern ( 4 rows) and it could work), but it's also a very frustrating pattern because if the length is even slightly wrong, then I have to pull out SO much work and my foundation and go back to drawing board. Not only that, but no matter how little I decrease by ( 4 instead of 12 or whatever it was) it still looks odd with those big thick strips). I much prefer working up like we've been doing, but it seems to be the trickiest to figure out. Thank you for working further, anxious to see what you get! You're welcome, I'm having fun tackling the challenge! Sorry to say that triples cupped as well, and spoiled the dainty proportion of the flowers. I've done other shapes at 90° that only needed a 1 or 2 extra stitches at the end and it worked fine, I guess this was just too much. At least we have taken the jog from 12 stitches down to 2 & 3 stitches. Left edge is ch 2, a split DC cluster made into the sides of the jog (so into the bottom of one stitch, and into the side of another), ch 2, sc into the point of the jog. The only little thing is the 2 stitch jog makes a smoother curve. Right bottom is similar, except 1 DC into the 'armpit' of the jog. Right top - 2 jogs left alone. I was going to do a 3 lobed picot in the center as you suggested in your first post, but thought it looked odd. I have to say it's way easier to work the pattern in jogs; when I was spreading out increases into 2 or 3 of the end stitches I really had to count a lot more to keep the pattern lined up. This way it matches the graph. 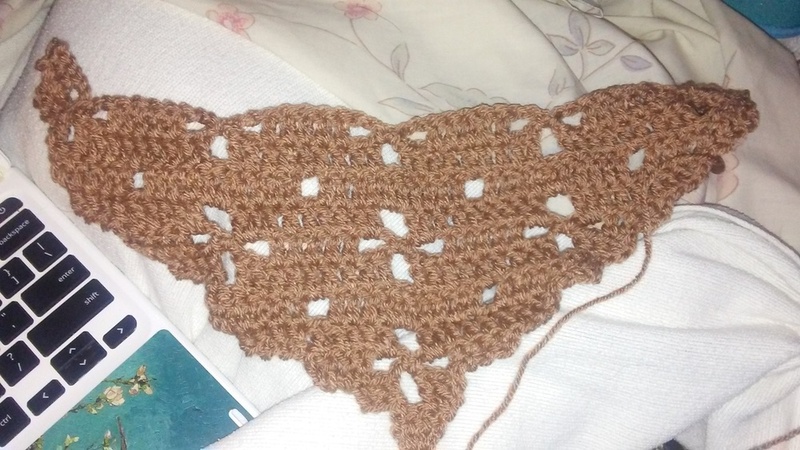 This one is easier, looks better IMO and forms a 3 stitch multiple for another edge if you want, or leave it at that A crab stitch all the way around would finish it off nicely maybe, and not take away from your flower pattern. SLST down the first DC, then DC into the 'armpit', HDC into the side of the next DC, SLST into the next point. Seems to work OK for both the 3 and 2 stitch jog.. Might want to SLST, SC, SLST into the bottom point to turn a nice sharp corner. How many did you originally chain in the foundation to work downwards with that swatch? That is definitely the best way I've seen to bridge the gaps and what I thought were ugly jogs in my first couple of swatches. Only thing is, I wonder how that method would look when the jogs aren't just 1 row ( like yours above is) but instead 4, which makes a larger chunk. I was going to show my swatch , but I lost it, how did I even lose it. But what I did was chain a few so that the chain was in between the "L" shape or armpit lol and then went into the corner of each jog and did a triple picot. It looked rather nice as the chain fell into the groove and created a nice look. But now I like your method better, especially because I wanted to fringe it. I mentioned how to make the stitches 'into the air' a few posts up, the one that started with "I give up". There are lots of videos out there if you've never done a foundation DC before. In a nutshell for a foundation DC in this case, you'd make a foundation stitch into the last DC in the row, which forms a base for the 2 or 3 more stitches you need to make in the air. Then after doing all the foundation stitches to extend the current row, you need to form a base for the extension of the beginning of the next row with chain 5 (for adding 3 stitches at the beginning of the next row) or chain 4 (for adding 2 stitches at the beginning of the next row), turn and DC into the 4th chain of the hook, and either the next chain for increasing 3 or the first DC if you are increasing 2. 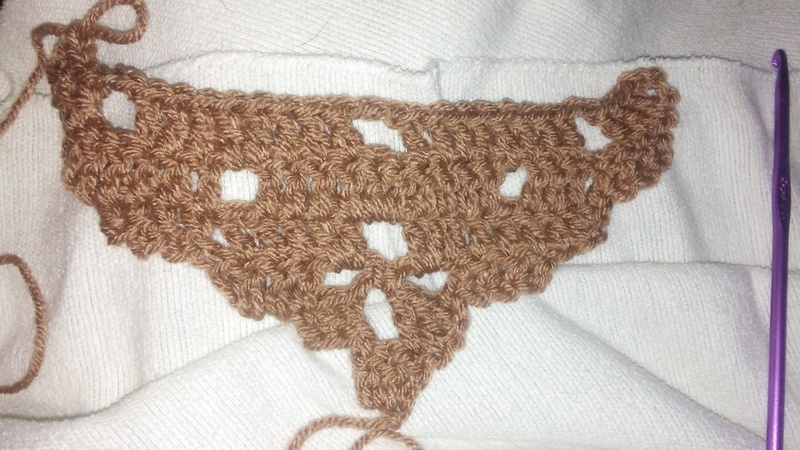 Foundation stitches are a little fiddly, and I don't normally use them for long foundations. In spite of their fiddliness, this swatch worked up much faster because it was less of a hassle to keep count than the other way. Ahhhhh!! You know- part of me started to realize what you had done after I asked you but now I know for sure. So that's what you do to add the stitches at the beginning of a row, and then at the end of the row you just put the same amount you increased by in the last stitch? I've done one or two patterns with foundation dc'ing to add to a row, so let me get one more thing straight, we only need to foundation dc at the beginning of every row? sorry for all these questions! thank you to the moon and back! At the end of each row you extend the current row by Foundation DCs and also chain the base for the extra stitches that start the next row. Maybe walking thru the first 3 rows will help. Row 1: 4 chains, 3 stitches into the 4th chain from hook. This is the only row that doesn't use foundation stitches. Now I need to set up the increase of 2 at the beginning of the next row. So I chain 4, turn. Row 2:, DC into the 4th chain from the hook. This gives me a chain that acts like a DC, plus a real DC, that extend beyond the first row. Following the chart, I DC in the first DC of row 1, chain 2, skip 2, Foundation DC in the last DC, then 2 more FDCs into the air. Now I need to increase 3 at the beginning of the next row, so I chain 5, turn. Row 3: DC into the 4th and 5th chain from the hook. This gives me a chain that acts like a DC, plus 2 real DCs, that extend beyond the row below. DC into the next 4 DC, 2 DC over the chain-2 space, chain 2, skip 2, 2 DC over the ch-2 space, DC in the next 3 DC, FDC in the last DC, then 3 FDCs into the air. To increase 3 at the beginning of the next row, chain 5, turn. It looks more complicated all written out than following the chart. The 'hard part' is remembering to FDC in the last stitch as a base to make 1 or 2 more FDCs, and to chain the right number for the increases needed for the following row. I just noticed the only difference is that I'm slst'ing in the original ch2 spaces that form the base of the flower whereas you're doing 2dc's, I don't think that changes anything though? I have an order I'm finishing up for a friend and then I'll take to it and see if I can figure it out. It's confusing in written form, but if I could see it in a video I think it would be crystal clear as I'm a very visual learner. However I think with enough trial and error I'll work it out. Thanks so much! I'll come back with progress! I totally missed the way you did the flower centers. I don't think that will matter, my only thought is "unless it keeps it from lying flat for some reason". but it seems to be behaving. Am I missing something, or is the left side of row 5 only increasing by 1 or 2, not 3? Even with the different way you did the centers, the stitch count on the chart should still work, and there should be 7 DCs to the left of the 1 stitch dot (on both sides). You just posted again as I was typing. It's a little hard to count your stitches on my screen but even moving around the 2s and 3s you I can't see how you are getting such smooth sides like that. And...I charted variations of 2s and 3s (but not irregular ones like 2-3-2-3-3), and the 2-3-3-3 was the only one (that I tried) that got the consistent margin between flower and the edge, without 'jogging' the flower pattern. So, you are at row 11. 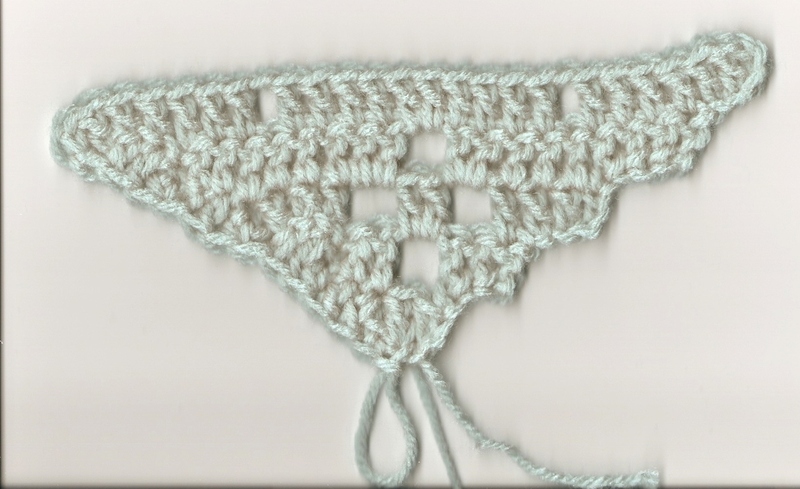 Following the chart, you should have 9 plain stitches at each end, and ... I can't quite tell, looks like 3 or 4? Question, just a sanity check - the flower petals are all 2 skipped stitches, right? Because it looks like some of the bottoms are only 1? Or it might be me looking at it funny. Your different flower centers should not matter to the graph I did, assuming the top and bottom petals are both 2 skipped stitches. Yes, I have 7 dc's to either side of the ch 1 sk 1 space rows. According to the chart, row 12 is where I should have 9 sts to either side of the pattern, I double checked after you said that. Row 11 is 4. Yes, the flower petals, row 1 and row 3 have 2 skipped sts, row 2 in between those is ch 2, sk2, slst in the previous ch2 of flower in row below, ch2, sk another 2 and resume crocheting 5 more dc's in between doing that again. As long as it is working for you. Just curious, 3-2-3-3 ... what is the next number? Because the repeat is 4 rows, it would be 3...right? So it's still three threes and a two, if you frame them differently. We may be on the same page and just looking at the same thing 2 different ways. You just posted as I'm typing...if you look at my last photo, the right side shows the that the steps are pretty clearly defined. I think the bottom one may look bigger because of the slope of 4 stitches together on the first row. Your edge looks nice, I can't see the puckering. Mine didn't, but I only went 5 rows. I need to sign off for today, I'll do a few more rows tomorrow and see what happens. Maybe I'll rip back and do my flower middles the same as yours and see if it makes a difference. Initial thought doing the flower your way--with my stitch tension at least, it is not lying flat at all, is really deforming right away. I'm trying chain 3, SC, chain 3, and it seems better. More thoughts tomorrow. Here is what I came up with. The bottom 2 flower rows were as described above (the bottom was chain 2, as it would have been to span 2 DCs on my chart). The top group of flowers I re-did a couple of times to keep it from deforming, I wanted to get the center to work with a slip stitch instead of the SC. What you are seeing is : bottom chain=4, top=ch4, slst, ch4. They come out quite a bit larger this way, but the petals are more uniform. When I say deforming - it wasn't cupping, it just wasn't making a nice straight triangle, the top edge was caving in quite dramatically. I don't know if it would have healed itself, which is why I altered the flower. The difference may be due to our stitch tensions, I dunno; but the center of the flower, in order to keep the fabric flat, can't be smaller than the dimensions of 2 DCs for it not to pucker. I followed the chart as far as the 2-3-3-3 pattern, I didn't have a problem with the counts not coming out right. I didn't try the edging, but the edges are laying the same way as my other swatch so I'd think it would come out the same. 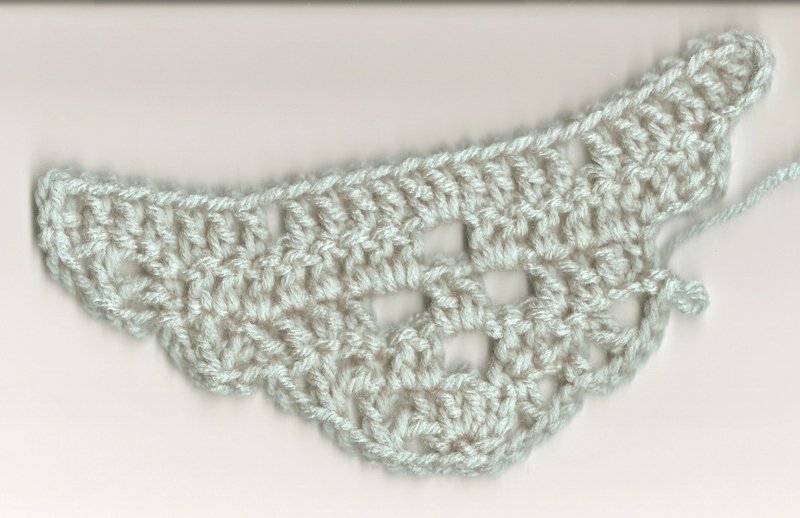 I don't think you subtle shell shape looks bad; it might be our stitch tensions, maybe try a DC and SC instead of HDC? Thanks for replying. It must be our tension because with the ch 2 flowers mine is coming out fine. I didn't take the picture on a flat surface earlier but when I lay it there it is fine. I know it doesn't look it but when I fold it together vertically, the edges mirror each other. 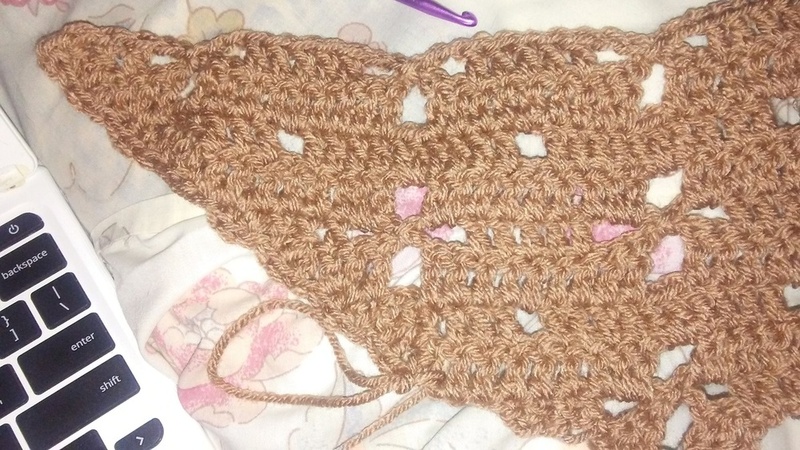 I will keep working as I have time, I changed colors to cream and used a smaller hook and I will post in a while. Thank you for this stitches into the air idea and the fdc. This wouldn't be possible as a triangle it seems without that. Hey Granny Square! I'm back with a quick question, that may turn into not being so quick for you, but I hope it's not a pain for me to ask. I've been working this pattern with great success and I still can't thank you enough! I've been wanting to experiment with another version where the flowers are a little closer together, so I figured out that I wanted there to be 5 dcs in between ch, sk2 ( for the bottom petal) instead of 9, 3dc in between ( for the middle row of flower) instead of 5, and likewise 5 more in between on the top petal instead of 9 again. I tried working it last night but I have no idea the number to do into the air and chaining at the beginning of a new row and it wasn't working out. I feel like I have to start all over with the pattern again, but surely I'm making it harder than it is? So, let me make sure I've got this right. The current version has 5 DC between the middle petals, and 9 between the top petals, so you are thinking of 5 between the top petals which would make only 1 between the middle petals, right? I will play with my spreadsheet and let you know. It should be as simple as deleting columns...maybe? How about this? 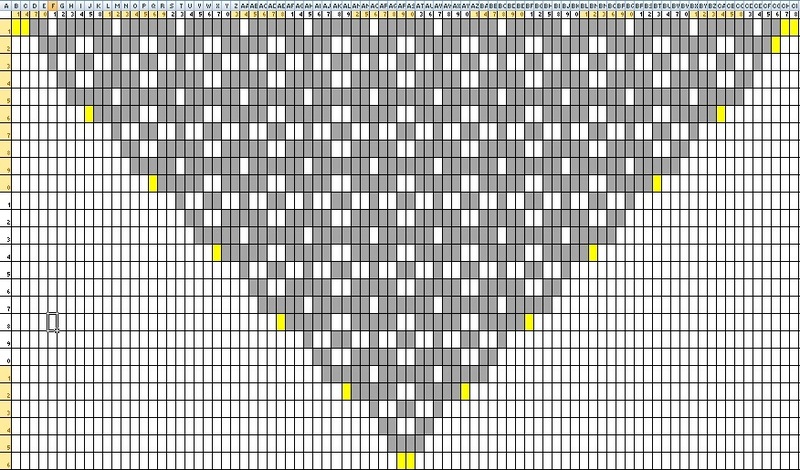 I deleted columns, then added back in some stitches at the edge (yellow) to make it a little less jagged. It changes the side angles, tho. Trying to preserve the shallower shape would make some long 'in the air' spans. yes!! that's correct, sorry it took me a while to respond, had a busy day, and thank you SO much for playing with this and rearranging it for me!! EDIT: I've just started working with it and I'm a little confused, not unusual for me. So, what did you chain to get that point at the bottom? and let me make sure I have this straight, at the end of each row, you're chaining 2, to get 1 in the chain and then 1 that acts as a dc? so 2? or it seems like I'm chaining too many?